The KMC Z1eHX Chain is a nickel-plated 1/2 x 1/8" chain for BMX, single speed, track, fixed gear and internal gear hubs with reinforced outer link plates and a tensile strength of 1200kgf (heavy duty design). 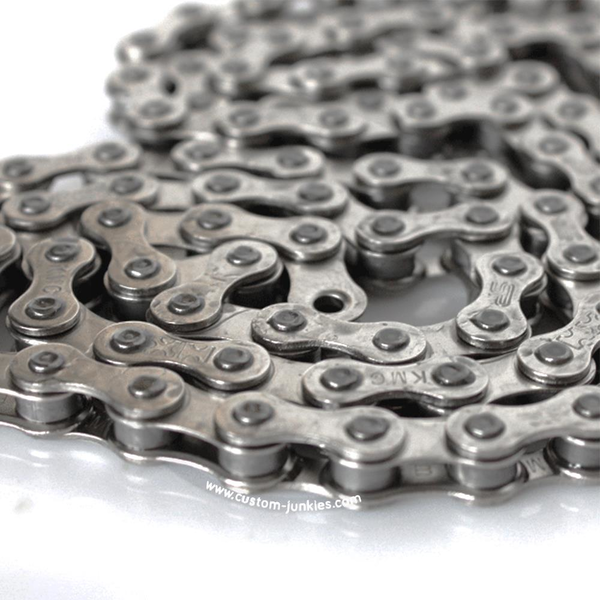 Thanks to a special heat treatment, this chain has a particularly long service life (Longlife Special Heat Treatment). With NoDrop inner links that prevent the chain from slipping off the sprocket and chainring, even if the chain tension is not 100% correct. Pin length: 9mm, length: 112 links, weight: approx. 430g, colour: silver.